Posted November 13th, 2018 by abim & filed under Uncategorized. The American Academy of Pediatrics – Committee on Infectious Diseases and the Pediatric Infectious Diseases Society released recommendations to protect hospitalized children from the effects of antibiotic resistance. Posted October 4th, 2018 by abim & filed under Uncategorized. The American Society for Clinical Pathology is recognizing several healthcare leaders for their commitment to the ABIM Foundation’s Choosing Wisely campaign. Posted June 22nd, 2018 by abim & filed under Uncategorized. The American Academy of Nursing announced five new Choosing Wisely recommendations concerning often routine treatment approaches that may not always be necessary or even in the best interest of patients. Posted June 4th, 2018 by abim & filed under Uncategorized. In its continuing mission to help occupational therapy practitioners provide the highest quality care to clients, the American Occupational Therapy Association announces its recommendations for quality, evidence-based occupational therapy services. Posted June 1st, 2018 by abim & filed under Uncategorized. Dheeraj Mahajan, MD, CMD, has been named a 2018 Choosing Wisely Champion by AMDA—The Society for Post-Acute and Long-Term Care Medicine. Posted May 8th, 2018 by abim & filed under Uncategorized. Posted February 20th, 2018 by abim & filed under Uncategorized. The ABIM Foundation is teaming up with the National Alliance of Healthcare Purchaser Coalitions to expand Choosing Wisely throughout its network of business coalitions, representing more than 12,000 purchasers and 45 million Americans. Posted November 15th, 2017 by abim & filed under Uncategorized. AAGL released a list of specific tests or procedures that are commonly ordered but not always necessary in Gynecologic Services as part of Choosing Wisely, an initiative of the ABIM Foundation. Posted October 26th, 2017 by abim & filed under Uncategorized. 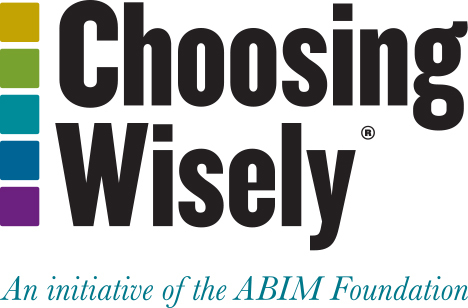 The ABIM Foundation released Choosing Wisely: A Special Report On The First Five Years to outline the many ways is inspiring conversations, projects and collaborations to reduce overuse in health care. Posted October 24th, 2017 by abim & filed under Uncategorized. Posted October 19th, 2017 by abim & filed under Uncategorized. Posted August 15th, 2017 by abim & filed under Uncategorized. Posted June 1st, 2017 by abim & filed under Uncategorized. The American Society of Health-System Pharmacists released five recommendations to facilitate optimal medication use for patients in acute and ambulatory care settings as part of the Choosing Wisely campaign. Posted May 13th, 2017 by abim & filed under Uncategorized. The American Urological Association (AUA) released a new list of recommendations regarding specific tests or treatments that are commonly ordered but not always necessary in urology, or urologic management that could be improved. Posted December 2nd, 2016 by abim & filed under Uncategorized. The American Society of Hematology (ASH) will recognize three Choosing Wisely Champions at its 58th annual meeting December 3-6 in San Diego.